I felt like some homeless waif who, after trying for years to take out naturalization papers, and being rejected by every country, has finally acquired a nationality. The Land of Letters was henceforth to be my country, and I gloried in my new citizenship. The publishing of The Greater Inclination broke the chains which had held me so long in a kind or torpor. For nearly twelve years I had tried to adjust myself to the life I had led since my marriage. . . . 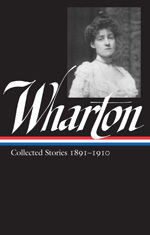 Although, Lee reminds us, some of Wharton’s illnesses were “real enough” and certainly didn’t vanish with her newfound respect as an author, there is little doubt that the success of her first book of fiction—which received strong reviews and sold a respectable 3,000 copies—served as an turning point in her life. It is not surprising, then, that of the handful of stories written during the 1890s, three were tales of marital misery. “A Journey” features a wife traveling with her terminally ill husband by train to New York. (Lewis suggests that there may be a bit of wishful thinking here on Wharton’s part.) The journey itself becomes a metaphor for an unhappy marriage: “Life had a grudge against her; she was never to be allowed to spread her wings.” If there’s an epilogue to this story, perhaps it’s to be found in the increasing distance in subsequent years between Edith and Edward Wharton, leading to their inevitable divorce in 1913. As she lay in her berth, staring at the shadows overhead, the rush of the wheels was in her brain, driving her deeper and deeper into circles of wakeful lucidity. . . . If you don't see the full story below, click here (PDF) or click here (Google Docs) to read it—free! Is there any literary criticism on this short story? Thompson, Terry W. "'A Journey': Edith Wharton's Homage to F. Marion Craawford's 'The Upper Berth'." South Carolina Review 40.1 (2007): 19-26. I would imagine that Thompson's article would summarize previous references to the story.